If you want to go on an exciting gambling journey then take a look at the brand new Orient Xpress Casino which will transport you to a world of games. Along the journey you can enjoy titles from developers such as Net Entertainment, NextGen Gaming, 1x2Gaming, Elk Studios and more. You will find a huge selection of slots to enjoy, both classic and video, with a number of them offering large progressive jackpots. There is an excellent selection of card and table games to enjoy such as roulette, craps and blackjack as well as a number of video poker titles. You can also play at a high quality live dealer casino. 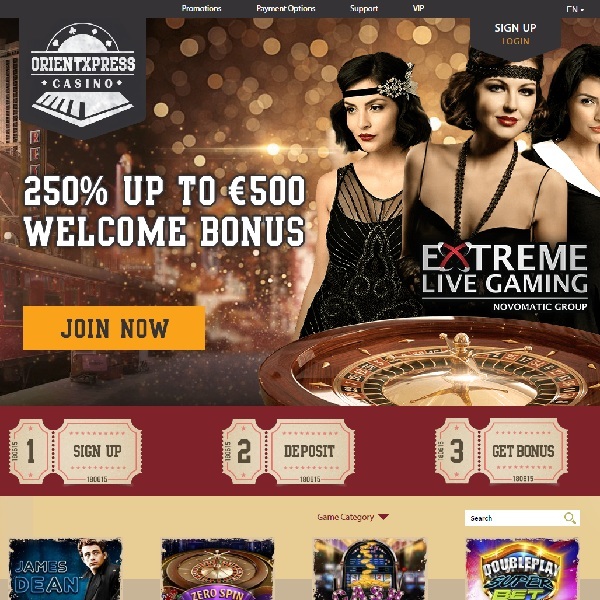 New members of the Orient Xpress Casino are offered a €5 free no deposit welcome bonus followed by a 250% first deposit bonus of up to €500. The casino is licensed in Curacao.